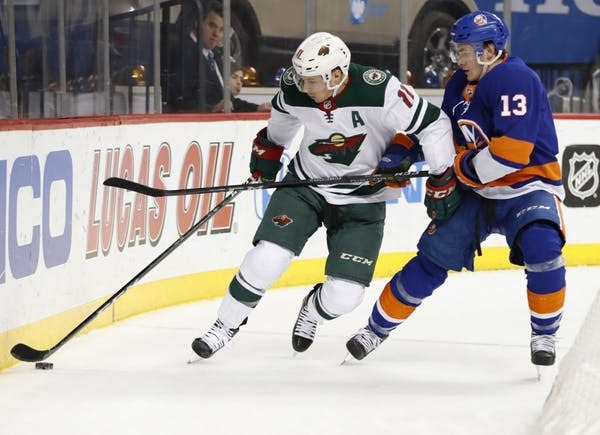 BROOKLYN, N.Y. – After opening this brief two-game road trip with a 4-2 win over the Devils Saturday, the Wild will go for a sweep Sunday when it visits the Islanders in Brooklyn. The victory snapped a four-game losing streak, and it was a performance led by the third line. Center Joel Eriksson Ek teamed up with wingers Marcus Foligno and Luke Kunin to tally three goals and five points, a smooth reunion for the three after they played together before the Wild’s eight-day break late last month. Kunin scored and added an assist, notching his fourth and fifth points during a career-high three-game point streak. Goalie Devan Dubnyk played Saturday, making 16 saves, and it’s unclear if he’ll handle the second half of the back-to-back or if backup Alex Stalock will start. 5-3-1: The Wild’s record in the second half of a back-to-back. 2-0: How the Wild fared against the Islanders last season. 7-3-1: Record for the Wild over its last 11 road games. 7: Points in the last seven games for defenseman Ryan Suter. 2: Goals for winger Zach Parise in his last four games. New York continues to lead the Metropolitan Division with 32 wins and 70 points after outlasting the Colorado Avalanche Saturday in overtime. Overall, the team has won 15 of its last 20. The Islanders are also 6-0-1 in their last seven games. Second-year center Mathew Barzal leads the group in points with 48. Winger Anders Lee has a team-high 18 goals. Can Wild avoid another letdown during four-game homestand?